Growing up, I was never really into basketball. I was terrible at playing it, my city doesn’t have a team (Pittsburgh has everything else, but no basketball! ), and the only college in Pittsburgh that could have been good (Pitt) wasn’t. That all changed when I went to college and saw the hype over March Madness every year! Many of my new friends came from tried and true college towns, such as Columbus, Lexington, or Charlotte, whose teams consistently made it into the tournament. I thought it was crazy that they treated their college teams like Pittsburgh does with the Steelers – and if you’re from Pittsburgh, you know exactly what I mean! The thought of basketball being so huge was foreign to me, but after watching the games and getting caught up in all of the excitement, I am now hooked. It became even more exciting last year when Pitt was a #1 seed! In addition to being a Pitt fan, my BFF got me rooting for Kentucky – the #1 overall seed this year and an amazing team. We attended a game last month at Rupp Arena and it was UNREAL. Seriously. If you have never been to a college basketball game at a large school with a good team, I highly suggest you go. The players ran into the arena with fireworks shooting overhead – in an indoor arena! Crazy. Anyways, all that being said, I am now a huge college basketball fan and love this time of year, so I really wanted to do something fun with March Madness in my classroom. During the month of March, our whole school studies one country – this year we’re learning about China – so rather than each individual teacher planning her own unit, we each teach a lesson to the whole school. This leaves many afternoons open for other activities. I was excited to do some March Madness activities because it would tie in math, geography, reading, writing, and research skills! To start our our March Madness unit, I explained what March Madness was and how seeding worked. 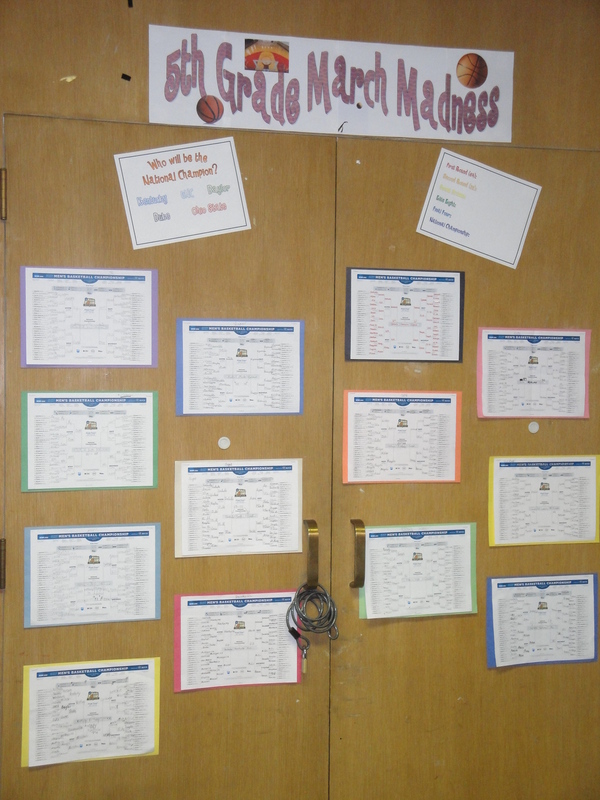 Each student was given a bracket to fill out in order to predict who would win each game, all the way to the championship. They also predicted a score for the championship game, just in case of a tie 🙂 We mounted their brackets on construction paper and hung them up in the room. Every day after games are played, I update their bracket by either crossing out the team if they guessed incorrectly or drawing a star if it was correct. Each round is also worth 32 points – for example, in the first round when there were a possible of 32 predictions, each game guessed correctly was worth 1 point. In the second round with only 16 possible predictions, each game was worth 2 points. The third round games were worth 4 points, and so on, each time totaling 32. I write their totals on the board so that they can keep track of who is in the lead. I also include their totals for each round on a chart that is posted above our brackets. 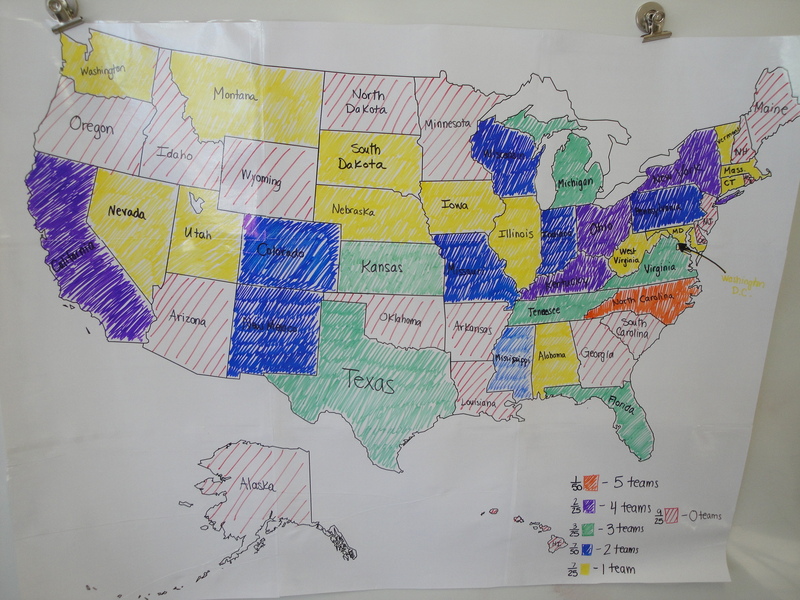 Each student received a map of the U.S. while I had a larger one hung on the board. 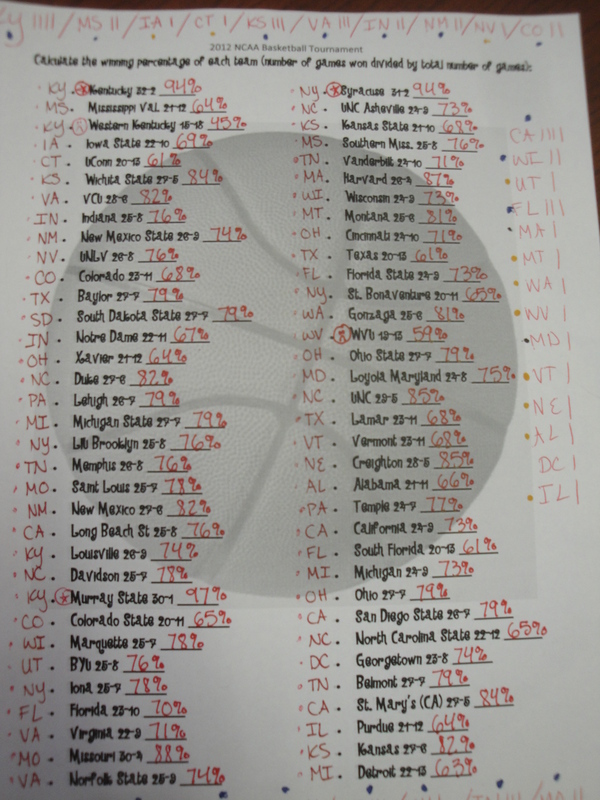 We then filled in each state with a different color based on how many teams that state has in the tournament. For example, NC has 5 teams so we colored it orange; KY, OH, NY, and CA each have 4 teams so we colored them purple; etc, creating a key in the corner of the map. 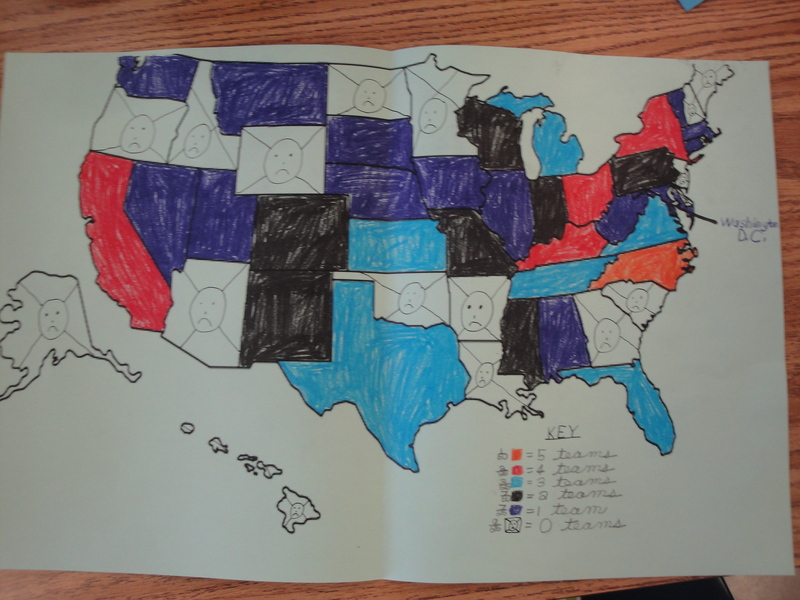 Once we colored our whole map, we determined the fraction and percentage of states with 5 teams, 4 teams, and so on. We also looked at the distribution of teams, noticing that the majority of states with teams are in the eastern part of the country. We discussed why this might be. Our next task involved each student choosing a team they were interested in learning more about. I created an information page for the students to fill out while doing research about their team. It involves everything from basic information, such as the team’s mascot, colors, and coach, to more detailed, such as the heights of each player and their field goal percentages (and looking to see if there is a correlation between the 2!). I found some websites for the students to use while conducting their research and set them off on their own. Now, I only have access to 6 or 7 computers in my room and the 4th grade room next door, so I created something for the rest of the students to work on while the other half was doing their research. I compiled a list of all of the Rounds 1 and 2 games that had been played and recorded the final score, as well as in what city the game was played. The students answered 13 questions about these games, including what games had the highest and lowest total points scored, what games had the highest and lowest points scored by a winning team, how many upsets there had been, which teams traveled the farthest/least far to play their first round game, and which two teams that played each other are farthest from/closest to each other geographically. They were allowed to use a calculator and an atlas to help with these questions. So what do you think?! This is what we have done so far; I am hoping to have each student present the information learned about their researched team, but I am trying to figure out a creative yet simple way to do so. Maybe a poster? 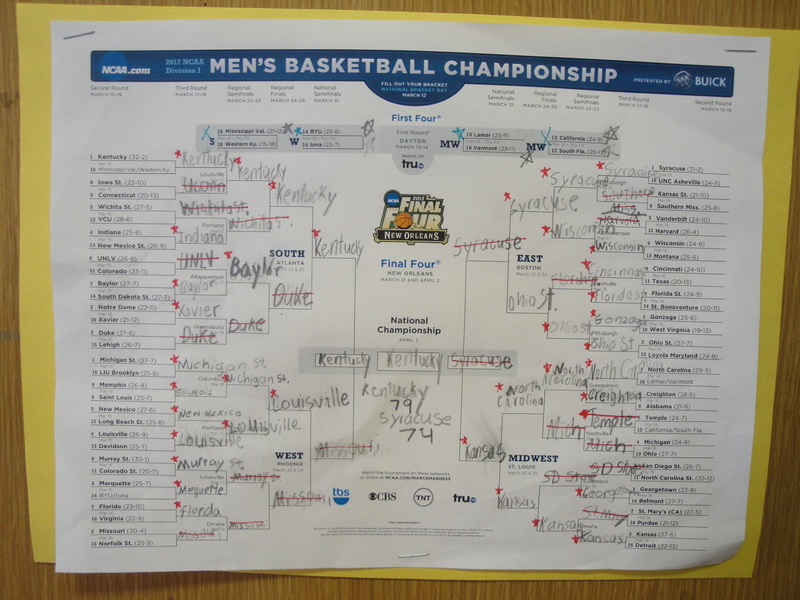 It’s been fun to see the students come in each day to check out their updated brackets and see how they did. I think many of them are watching the games at home too, because they like to ask if I watched a particular game and if I “can believe that they won? !” or some comment like it. This has been an exciting way to keep our March busy and fun, and thankfully the students are enjoying it too! !